my analysis of the carpet uses some of the methods i applied for my grid exercise. i wanted to work in a grid but not a rectangular rigid grid like the one i worked on for the exercise. so, i made my own grid. so the grid still has a mid point like on persian carpets and has several smaller sections. it is also semi-symmetrical. 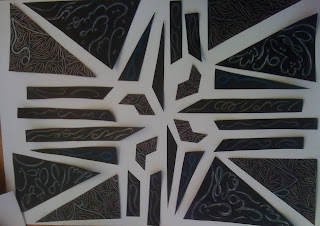 then i combined the patterned pieces with the calligraphic compositions i made for the grid exercise. the words are different, but they're still persian. the composition can be arranged in a circular or rectangular form. in the rectangular form in the photo above, it is spread on an a2 size, however, it fits on an a3 when all the pieces are put together. i will refine this further during the break.